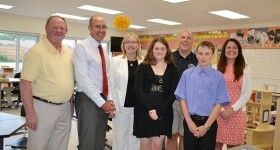 On June 17, 2015, Our Lady of Sorrows Catholic Elementary School in Petawawa hosted an official celebration of its two-storey, 1,300 square foot addition. “The Renfrew County Catholic District School Board is very excited to meet the growing needs of our students and the community with the completion of this project,” said Trustee Dave Howard. Final touches on a new kindergarten classroom with washrooms for little ones on the first floor, as well as a regular classroom and three offices for support staff on the second floor were completed in the fall of 2014. An ongoing investment in technology means that all classrooms are fully equipped to engage students in a 21st century learning experience. Assistive technology, iPads, Chromebooks and smart boards also help to enhance programs such as Extended French and Special Education. While the new addition is completely seamless with the original building both inside and out, students appreciate the new space. With origins dating back to 1939, the school is a fixture in Petawawa and the Catholic community. Its location in the heart of town means students and teachers have access to many resources in close proximity—the library, the Catwalk, Dundonald Hall Fitness, Sports & Aquatic Centre, the Civic Centre, and more. The school has forged important relationships among home, school, parish and the extended community. The school received tremendous support from the entire community recently to help create an outdoor classroom where students can learn the importance of environmental stewardship. An exciting new partnership with the Petawawa Military Family Resource Centre led to the development of a before and after school child care program in two classrooms. Our Lady of Sorrows is certainly a school to believe in, says Principal Christina Brown, pointing to the dedicated staff, special programs and events, and vision for the future. Attending the celebration were: RCCDSB Trustee Dave Howard, Vice-Principal Scott Nichol, RCCDSB Superintendent of Business Mary Lynn Schauer, Grade 7 student representative Hannah Hawker, Petawawa Councillor Murray Rutz, Grade 7 student representative Kade MacWilliams and Principal Christina Brown.